If you know cats, then you probably know that most cats love bathrooms. Does your cat follow you into the bathroom? Perhaps he rubs on your legs while you are in there. Maybe he lounges in the sink even when you're not around. He might meow loudly and paw at the door if you close it and leave him outside. Some cats seem to want more attention when you are in the bathroom than they do when you are anywhere else in the house. What is it about the bathroom that cats seem to love so much? Bathrooms can seem like playrooms to some cats. There's a tub to spin around in and toilet paper rolls to play with. There may be fun things like towels and robes hanging on the wall. They might be able to roll around on the floor and play with the rug or bathmat. A cat can have a lot of fun in the bathroom, whether or not you are in there. Plenty of owners have learned this the hard way when they get home to find kitty's disaster in the bathroom. Hopefully, you won't have to deal with a worse mess, like pooping or peeing in the sink or tub! Most cats cannot stand closed doors in their homes. The bathroom door is no exception. In fact, a closed bathroom door with you on the other side could be enough to drive your cat crazy. Over time, some cats seem to learn that you are likely to close that bathroom door. So, they want to be there to make sure they don't miss out on the fun. Cats want to know what is happening in their domains at all times. If cats had one rule, it would be that there should never be closed doors! Cats love attention (as long as it's on their terms). Let's face it, who's not going to pet a sweet cat who is rubbing all over your legs while you sit on the toilet. The cat seems to know you are "trapped" in there for at least a few minutes and that it'll be easy to get your attention. It also may be that your cat can tell you are not distracted by the television, a book, work, or some other activity. You are there doing nothing too serious, able to return the love and attention they give you. Many cats also like to lick their humans after a bath or shower. Silly kitties! Think about the shape of the sink. The rounded sides seem to perfectly cradle the feline body. It seems only natural that a cat would enjoy the feeling of a sink to lounge and sleep in. The coolness of the sink might feel good in warmer months. During cold months, the cat's body heat might actually warm up the sink and make it extra cozy in there. Some cats will also lick drops of water out of the faucet while lounging in the sink. Although most cats don't like to be wet, many like to be around water. In the bathroom, a cat can drink fresh water from the sink or tub faucet. 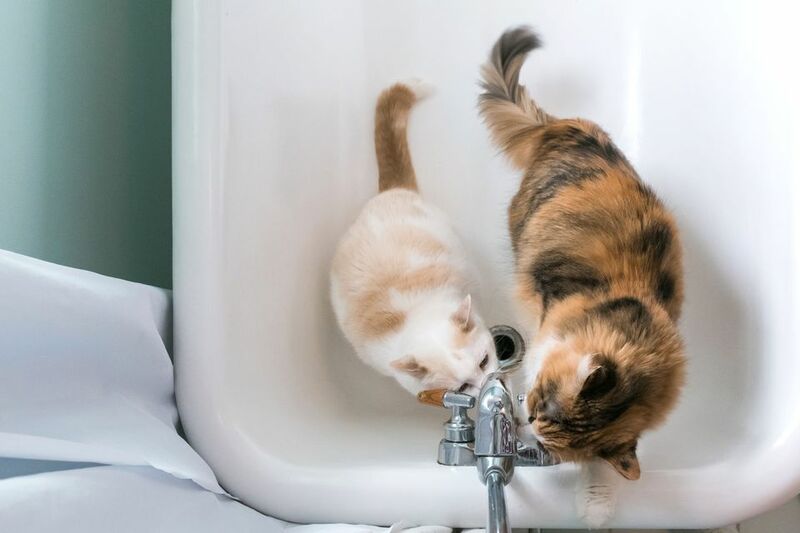 Fresh running water is just one of many things that cats love. Cats that like sinks will sometimes get in there while the water is running. Some cats like to lick the wet tub or even drink bathwater! Coming to visit you in the bathroom can become a routine your cat learns to love, especially if you give in to his pleas for attention. You cat may also be anticipating mealtime if that's something you do after using the bathroom in the morning. The bathroom is full of the smells of you, your cat's favorite human! You spend time in there doing important things, or at least it may seem that way to your cat. Your cat may be intrigued by watching you do all the little things we humans do in there. Many cats will sit on the vanity, mesmerized while you brush your teeth or do your hair. Bathroom time may actually be some very valuable feline bonding time!